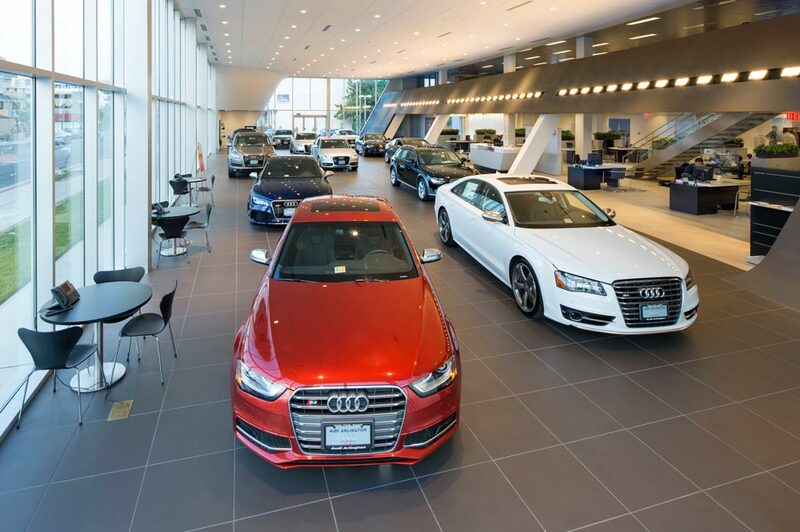 Audi Shawnee Mission in Lenexa, KS – serving Kansas City, Shawnee Mission, Mission, Overland Park, Leawood, Lee Summit, and Merriam – is a new and used Audi dealership offering everything you need under one roof. We carry a vast inventory of new Audi models and a great selection of pre-owned vehicles, so you are sure to find what you’re looking for at our dealership. Our team also includes a fully staffed service department with highly-trained technicians for all your maintenance needs. When it comes to purchasing your vehicle, there’s no one more helpful than our dedicated finance professionals. We hope to see you at 8035 Lenexa Drive, Lenexa, KS, for a test drive, and look forward to putting you behind the wheel of the new Audi you’ve always wanted! Shopping for new Audi vehicles at Audi Shawnee Mission in Lenexa, KS – serving Kansas City, Shawnee Mission, Mission, Overland Park, Leawood, Lee Summit, and Merriam – is a fun, stress-free experience for every type of driver. Explore our current inventory online, and find new Audi models matching your exact preferences with our handy search tools. Our dealership frequently updates the new Audi specials page, so you can see the best offers on our most popular Audi vehicles. Once you’ve narrowed down your choices, visit Audi Shawnee Mission in Lenexa, KS, for your test drive. There are a variety of certified pre-owned Audi vehicles available at Audi Shawnee Mission in Lenexa, KS – serving Kansas City, Shawnee Mission, Mission, Overland Park, Leawood, Lee Summit, and Merriam. Let our team help you explore the pre-owned vehicles in our inventory, so you can find the affordable new Audi of your dreams. With each certified pre-owned Audi vehicle comes a Limited Warranty that’s one of the most comprehensive pre-owned warranties in the industry. It features roadside assistance and coverage for 6 year or 100,000 miles, whichever comes first. Browse our current pre-owned Audi inventory online today, and then call to schedule your appointment with Audi Shawnee Mission. Shop for used cars at Audi Shawnee Mission in Lenexa, KS – serving Kansas City, Shawnee Mission, Mission, Overland Park, Leawood, Lee Summit, and Merriam. Our pre-owned vehicle inventory is home to many affordable cars and SUVs that will make the perfect companion for your travels. Each used vehicle has been thoroughly inspected for quality and reliability by our trained technicians, so you can depend on them for your everyday driving needs. Search our online used inventory pages to find models matching your exact specifications, and then call to schedule your used test drive. The finance center at Audi Shawnee Mission in Lenexa, KS – serving Kansas City, Shawnee Mission, Mission, Overland Park, Leawood, Lee Summit, and Merriam – provides all the help you need when it comes to new auto loans and used car financing. Our team of professional financial advisors will show you all the options available before you commit to your purchase. We work with local and national lenders to provide one of the most well-rounded selections of financing for your new Audi. Our online finance application will speed up your car buying process, so you can spend less time at the dealership and more time behind the wheel. Call Audi Shawnee Mission today to schedule your financial appointment, and soon you’ll have the keys to your new Audi vehicle. For all your service and repair needs, depend on the experts at Audi Shawnee Mission in Lenexa, KS – serving Kansas City, Shawnee Mission, Mission, Overland Park, Leawood, Lee Summit, and Merriam. We strive to service your vehicle quickly and to offer convenient solutions for your maintenance needs. Our team of highly-trained professionals is certified to work on your Audi vehicle, so you know we’re the best option for dedicated Audi service and repairs. Our team also uses genuine Audi parts for every appointment, which maintains the high value and integrity of your exceptional Audi vehicle. When it comes time for your next tune-up conveniently schedule your service appointment online or by calling the dealership. Be sure to see our service specials before your visit, so you can take advantage of any offers or discounts available. Audi Shawnee Mission in Lenexa, KS – serving Kansas City, Shawnee Mission, Mission, Overland Park, Leawood, Lee Summit, and Merriam – wants to be your one-stop shop for all your automotive needs. We’re proud to offer a large new and used Audi inventory with models designed for every type of driver. We look forward to seeing you at 8035 Lenexa Drive, Lenexa, KS, for a test drive! Audi Shawnee Mission in Lenexa, KS - serving Kansas City, Shawnee Mission, Mission, Overland Park, Leawood, Lee Summit, and Merriam - is a new and used Audi dealership offering everything you need under one roof. We carry a vast inventory of new Audi models and a great selection of pre-owned vehicles, so you are sure to find what you're looking for at our dealership. Our team also includes a fully staffed service department with highly-trained technicians for all your maintenance needs. When it comes to purchasing your vehicle, there's no one more helpful than our dedicated finance professionals. We hope to see you at 8035 Lenexa Drive, Lenexa, KS, for a test drive, and look forward to putting you behind the wheel of the new Audi you've always wanted! Shopping for new Audi vehicles at Audi Shawnee Mission in Lenexa, KS - serving Kansas City, Shawnee Mission, Mission, Overland Park, Leawood, Lee Summit, and Merriam - is a fun, stress-free experience for every type of driver. Explore our current inventory online, and find new Audi models matching your exact preferences with our handy search tools. Our dealership frequently updates the new Audi specials page, so you can see the best offers on our most popular Audi vehicles. Once you've narrowed down your choices, visit Audi Shawnee Mission in Lenexa, KS, for your test drive. There are a variety of certified pre-owned Audi vehicles available at Audi Shawnee Mission in Lenexa, KS - serving Kansas City, Shawnee Mission, Mission, Overland Park, Leawood, Lee Summit, and Merriam. Let our team help you explore the pre-owned vehicles in our inventory, so you can find the affordable new Audi of your dreams. With each certified pre-owned Audi vehicle comes a Limited Warranty that's one of the most comprehensive pre-owned warranties in the industry. It features roadside assistance and coverage for 6 year or 100,000 miles, whichever comes first. Browse our current pre-owned Audi inventory online today, and then call to schedule your appointment with Audi Shawnee Mission. Shop for used cars at Audi Shawnee Mission in Lenexa, KS - serving Kansas City, Shawnee Mission, Mission, Overland Park, Leawood, Lee Summit, and Merriam. Our pre-owned vehicle inventory is home to many affordable cars and SUVs that will make the perfect companion for your travels. Each used vehicle has been thoroughly inspected for quality and reliability by our trained technicians, so you can depend on them for your everyday driving needs. Search our online used inventory pages to find models matching your exact specifications, and then call to schedule your used test drive. The finance center at Audi Shawnee Mission in Lenexa, KS - serving Kansas City, Shawnee Mission, Mission, Overland Park, Leawood, Lee Summit, and Merriam - provides all the help you need when it comes to new auto loans and used car financing. Our team of professional financial advisors will show you all the options available before you commit to your purchase. We work with local and national lenders to provide one of the most well-rounded selections of financing for your new Audi. Our online finance application will speed up your car buying process, so you can spend less time at the dealership and more time behind the wheel. Call Audi Shawnee Mission today to schedule your financial appointment, and soon you'll have the keys to your new Audi vehicle. For all your service and repair needs, depend on the experts at Audi Shawnee Mission in Lenexa, KS - serving Kansas City, Shawnee Mission, Mission, Overland Park, Leawood, Lee Summit, and Merriam. We strive to service your vehicle quickly and to offer convenient solutions for your maintenance needs. Our team of highly-trained professionals is certified to work on your Audi vehicle, so you know we're the best option for dedicated Audi service and repairs. Our team also uses genuine Audi parts for every appointment, which maintains the high value and integrity of your exceptional Audi vehicle. When it comes time for your next tune-up conveniently schedule your service appointment online or by calling the dealership. Be sure to see our service specials before your visit, so you can take advantage of any offers or discounts available. Audi Shawnee Mission in Lenexa, KS - serving Kansas City, Shawnee Mission, Mission, Overland Park, Leawood, Lee Summit, and Merriam - wants to be your one-stop shop for all your automotive needs. We're proud to offer a large new and used Audi inventory with models designed for every type of driver. We look forward to seeing you at 8035 Lenexa Drive, Lenexa, KS, for a test drive! Audi Shawnee Mission in Lenexa, KS treats the needs of each individual customer with paramount concern. We know that you have high expectations, and as a car dealer we enjoy the challenge of meeting and exceeding those standards each and every time. Allow us to demonstrate our commitment to excellence! Our experienced sales staff is eager to share its knowledge and enthusiasm with you. We encourage you to browse our online inventory, schedule a test drive and investigate financing options. You can also request more information about a vehicle using our online form or by calling 9133261843.